[Dev] New, deleted and merged forums! Thread: New, deleted and merged forums! New, deleted and merged forums! As discussed in our recent feedback thread (here! ), I have just surfaced from FOUR hours of simplifying and merging the forums! • After @dbgtz;'s suggestion the forum "Show off your Habbo skills" has been renamed "Show off your Habbo creations" and comes with graphics, room and alteration prefixes. The old elite alterations and rooms have survived as subforums. • Anime and other entertainment is now just "Other Entertainment"
- - Congratulations and Thank Yous! - - Congratulations and Thank Yous! 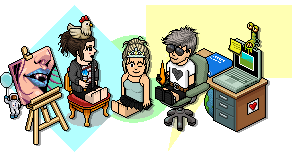 - - Show off your Habbo skills! - - Show Off Your Website Here - Including Habbo Fansites - - - Show off your website! Last edited by lawrawrrr; 09-09-2018 at 05:23 PM. Last edited by lawrawrrr; 09-09-2018 at 06:28 PM.